Great acts of kindness move us to the core and the story of Margarita Rojas Suarez does just that. Margarita is a grandmother living in Mexico who dedicates her life to caring for her grandson, Othon, who is living with cerebral palsy. Due to this medical condition, Othon is confined to a wheelchair and is unable to walk or perform most daily activities without assistance. Although Margarita is in her late 80s, she carries Othon up and down stairs and on and off multiple city buses so that he can receive treatment at a rehabilitation center that is helping him learn to walk. She selflessly does this, day in and day out, to give her grandson the best chance at a bright future. Her commitment is steadfast and her love is unwavering. Thank you, Margarita, for showing us the infinite strength in your kindness. Watch the video above to learn more about Margarita and Othon’s story. Though the video was published a few years ago, its message is timeless. For English subtitles, click the “cc” icon on the video bottom banner and select the bar that says “Spanish.” Select “Translate Captions” and choose English as your language. KIND has Inspired 1 Million Acts Of Kindness! The company’s team members have been taking note of kind acts performed, facilitated or celebrated as part of the movement. They also track the people involved in their “Kind Causes” program. As part of the program, every month, people submit causes they’re passionate about to the company’s website, while others vote for the cause that resonates with them. The cause with the most votes then gets a $10,000 grant from Kind. The acts tracked by Kind have included things like delivering coats to homeless people, shoveling strangers’ driveways during snowstorms and creating care packages for soldiers overseas. Hitting the 1 million mark is a milestone for the company, but Kind Founder Daniel Lubetzky wrote in his book, “Do The Kind Thing,” that the idea started small. See the full speech after the jump. My Dad used to tell us a story he conceived about a little bird named Bimbambu when we were kids. It is one of my favorite stories – about a kindly bird who literally sheds all his feathers in order to help other animals fight the winter weather along the way, only to end up without any protection until all the animals come to his aid. This may very well have been one of the subconscious foundations for the creation of KIND and the KIND Movement, as it teaches the important lesson of exhibiting unbridled kindness to everyone we encounter. 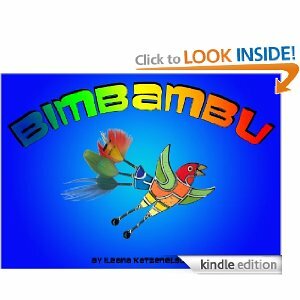 And now my sister Ileana has brought the story of Bimbambu to life in a colorful and beautifully designed digital children’s book so that other parents can share Bimbambu’s lessons in kindness with their children too. The Kindle e-book edition is available on Amazon now (and I was able to view it on my Ipad by downloading the free Kindle reader), and I look forward to seeing the print copies in English, Hebrew and Spanish soon! 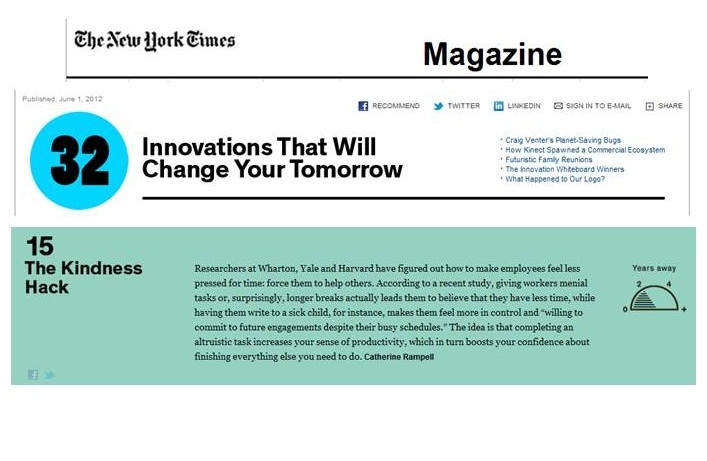 According to the New York Times’ ‘Innovations That Will Change Your Tomorrow,‘ researchers found that people who take time out of their day to help others have an increased sense of productivity and confidence in their ability to complete their work. So don’t forget to Do The KIND Thing! Another KIND Tuesday has come and gone, and this time, your kindness has enabled us to deliver Thanksgiving meals to seniors in need! This big feat was impressive enough to capture CBS LA and LA Magazine’s attention, as you can see from the great clips below. CraigConnects, a forum founded by Craig Newmark, is dedicated to “connecting the world for the common good.” This month, CraigConnects is running a great campaign to benefit our men in uniform; as Craig puts it, “if someone is willing to risk a bullet to protect me, least I can do is to support them.” That is why this month, CraigConnects is running a grant challenge for four veteran oriented nonprofits. The organization that raises the largest number of donations will receive a $100,000 grant. Craig’s initiative would be admirable at any point of year but is of special interest to us this month. For the month of July, Do the KIND Thing is working to benefit veterans and troops who have risked their lives and given their time to protect our country. To make your KINDNESS count, visit http://www.kindsnacks.com/world/mission. It will be excited to see which organization wins the grant, as well as to see the realization of projects benefiting soldiers and veterans. One small KIND act from you can make a BIG difference in the lives of those who really need it! Do the KING Thing and help to make possible the BIG KIND Act of providing new books to children from low income families across the country. 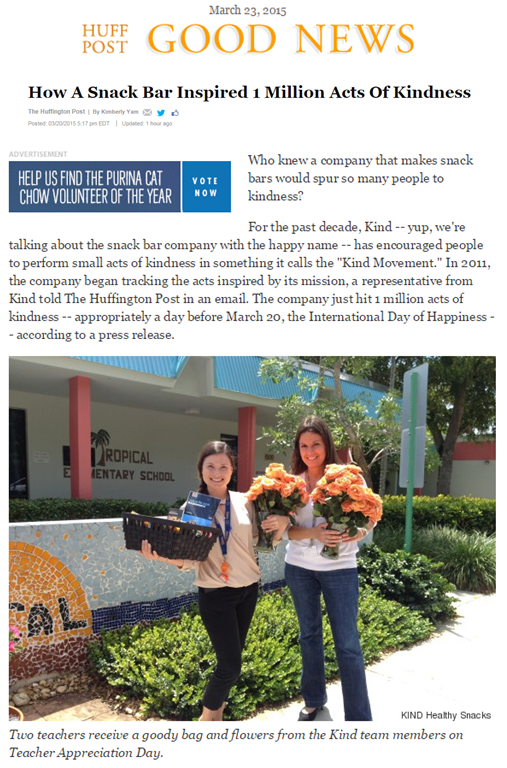 Visit www.KINDsnacks.com/world/mission to accept the KINDING Mission and get us one step closer to making the BIG KIND Act happen. NewHope 360 featured Daniel earlier this month, recognizing his generous spirit and acute leadership skills that we see each day. 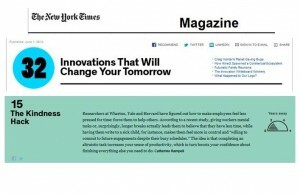 The article conveys that these attributes have granted KIND success in its growth, in being named Entrepreneur of 2010, and in Do the KIND Thing. Read more below! This video, launched by Entrepreneur Magazine encapsulates some of the attributes that made KIND’s Daniel Lubetzky win the 2010 Entrepreneur of the Year Award, and carries new meaning since the Award was announced. Among the key lessons: build a supportive environment for a super-star team, and use technology to simplify life, and food, rather than to complicate it. Innovator – Kind Snacks from OC Creative Media on Vimeo.